The home you want is waiting for you at The Abbey at Champions. Have your pick of spacious and stylish one bedroom and two bedroom apartments for rent in Houston, Texas. Cozy one bedroom apartments start at 566 sq. ft. and include up to 820 sq. ft. of living space for you to enjoy. We offer two bedroom, one bathroom apartments ranging from 848 sq. ft. to 864 sq. 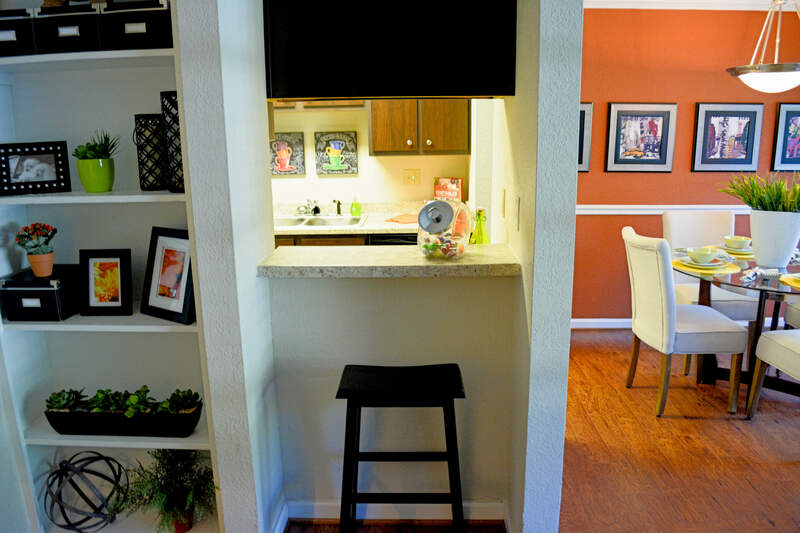 ft., as well as a variety of floor plans for our two bedroom, two bathroom apartments range from 976 sq. ft. to 1052 sq. ft. of livable space. So whether you’re a party of one or more, you’ll find the right layout for your needs in our pet-friendly Houston apartment community. If you’re looking for Houston apartment for rent with stylish finishes and modern amenities, The Abbey at Champions has the home for you. Each one and two bedroom home is equipped with stainless-steel, energy-efficient appliances, stylish wood-plank vinyl flooring, and faux-granite countertops. To explore your favorite one bedroom and two bedroom floor plans, schedule a personal tour today.